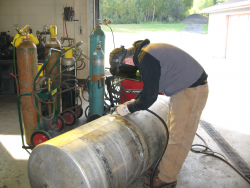 The Welding II program is offered to students who have either completed Welding 1, or who can demonstrate adequate proficiency with all skills taught in Welding I. This program consists of advanced Shielded Metal Arc Welding (SMAW) in all positions, using E6010, E7018, and E11018 electrodes. Gas Metal Arc Welding (GMAW) is also taught, using both solid and flux cored wires. Gas Tungsten Arc Welding (GTAW) of ferrous and non-ferrous metals will be covered as well. By the end of Welding II, students will have received adequate training to pass the American Welding Socitey (AWS) Limited Base Metal Thickness Plate Test – a nationally recognized certification.